There is some debate over the exact origins of salsa, but many historians agree that this popular music and dance were born in Cuba. Salsa music is a mish-mash of Latin musical rhythms centered mostly on traditional Cuban son music from the east. The high-energy music and accompanying dance gained its name in New York in the 1960s where son was fused with big band music and jazz, and Cubans and Puerto Ricans living in the big apple transformed the dance accordingly. Cuban culture itself has evolved from a fascinating blend of cultures brought to the island by Spanish colonizers and African slaves. Music and dance have always been a crucial part of this mix, and remain very much a part of everyday life in Cuba today. To Cubans, a party isn’t complete without music and dance, and salsa is usually the go-to. Contrary to popular belief about travel to Cuba for Americans, it’s perfectly legal to go salsa dancing! 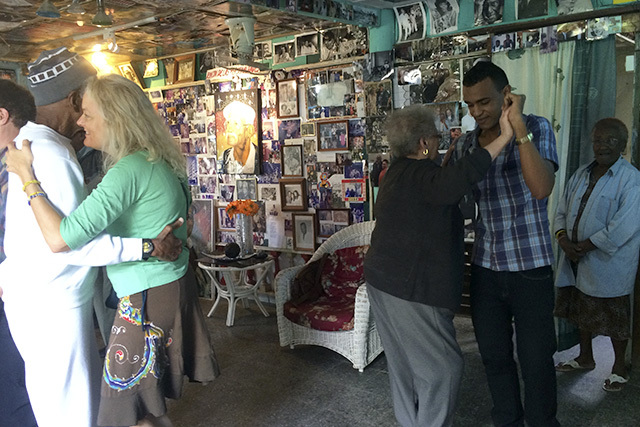 On your InsightCuba tour, after a day of expertly curated people-to-people immersion into Cuban culture and society, we encourage you to slip on your dancing shoes! There are few ways to have more fun and make new friends during your Cuba tour than to do as the Cubans do. La Casa de la Musica (the House of Music) lives up to its name. Cuba is overflowing with extremely talented musicians who are the backbone of the island’s unique and vibrant nightlife. Casa de la Musica, with two Havana locations, brings world-class Cuban acts to its small, intimate stages every night. Tired from a long day of sightseeing? The best shows are actually the matinees that kick off around 6pm when you’re likely to see higher doses of locals shaking off the workday. Yes, that Buena Vista Social Club. The band is still together and their performance is still just as fun as ever. Ask your InsightCuba tour leader or hotel concierge where the next one is. And don’t be fooled by the dinner seating – bring your dancing shoes because the band leader will know how to get you on your feet, with or without mojito in hand. Jardines del 1830 hands down wins the prize for the best location. The dance floor is an open-air patio nestled in the garden of a historic mansion (now a restaurant) right on Havana’s seafront, where the Almendares River meets the ocean. Even better, it’s just a short walk from the Melia Cohiba Hotel, where most InsightCuba tours stay while in Havana. Despite the extravagant exterior, Jardines del 1830 provides a casual ambience with plenty of locals to show the foreigners how it’s done. Every Sunday, the venue hosts a large casino de rueda event, Cuba’s own special brand of salsa in which dancers form a giant circle (rueda means wheel) and switch partners. El Sauce, the largest of the venues, is a grassy backyard space with two large stages on the outskirts of Havana. What it lacks in glamour and proximity, it makes up for in authenticity. The biggest names in Cuban music regularly headline the Tuesday-Saturday shows that begin at 9pm. There is no shortage of Cubans who make the trek out to El Sauce for a truly good time. Dancing is a huge part of Cuban culture. No party is complete without it, and Cubans love to have a good time. So for those who want to get in on the fun but need to brush up on their salsa 101, master Cuban dancers regularly hold classes. Whether you need to learn the basics or want to add Cuba’s casino de rueda to your repertoire, your InsightCuba tour leader will be able to help you find the right class for you. so glad you added the info on Salsa! When we went on our March InsightCuba trip my daughter and I desperately wanted to salsa. Our awesome InsightCuba guide, Alfredo, arranged for a dance troupe we visited to include a group salsa lesson at the end of their performance. So much fun and so incredibly nice if Alfredo! Great memory! Hi Jill! We are so happy to hear that you and your daughter enjoyed your trip with us. It's hard not to fall in love with the rhymic song and dance of such a lively country! Hope you join us in Cuba again soon! I am planning a trip to Cuba (Oct 2017) to find unknown family if possible. While im there i plan on going dancing and hope to share my love for dancing bachata con mi gente. I went to Cuba in April 2017 with my 9 year old son and was THRILLED to be able to see the Buena Vista Social Club play at the Hotel Nationale. What a show! Well, very good post with informative information about dance forms.I adore Salsa dance! Lots of people want to learn to dance Salsa, but let the dream go once they realize that learning to do it well involves work.